I've been interested in the Mexican Dia de los Muertos (translates to Day of the Dead) celebration for years. The reason I got into it was mostly due to my love of Halloween and learning more about the origins of this holiday. Since Dia de los Muertos is on November 1-2, it also gives me a reason to keep my front porch decorated past October 31. 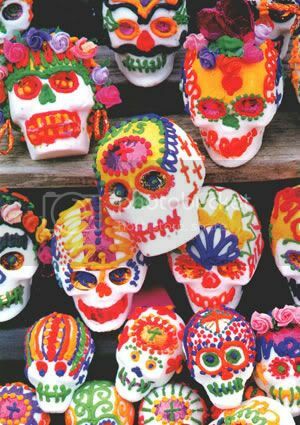 On of my favorite imagery from this holiday is sugar skulls. Sugar skulls are really what the name describes. Skulls made of sugar. They are decorated with bright designs using icing. 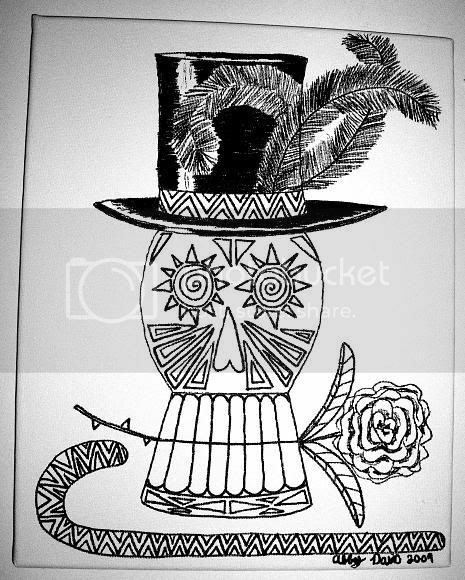 http://www.mexicansugarskull.com/ is one that I found with a quick google search of "Sugar Skulls" and they seem to not only have the needed supplies, but also include some other types of Mexican artwork featuring skeletons, skulls and other Mexican imagery. If you are a local to Richmond, VA or just passing through, stop inside World of Mirth in Cary Town. They normally carry the supplies to make these decorative treats. 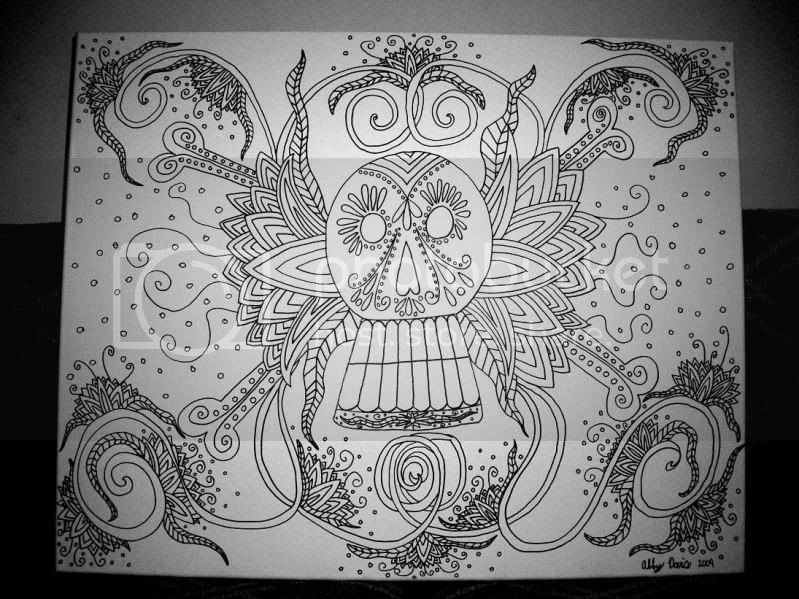 It's the combination of the traditional Sugar Skulls and related art work with more intricate designs that got me into drawing my own. I've been drawing Sugar Skulls for Halloween decorations for years, but it wasn't until this year that I decided to make use of my designs and start putting them on things like clothing, tote bags and canvases. 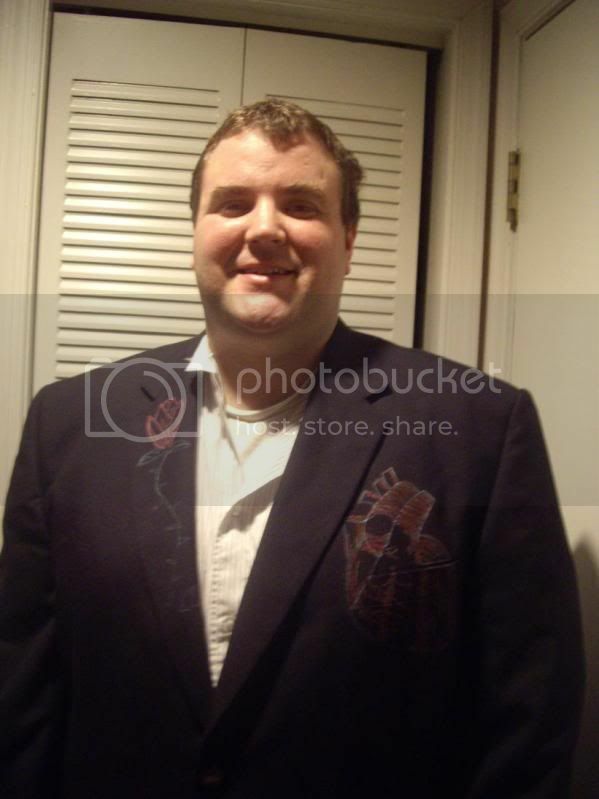 For the 2nd one, I used an old suit jacket of my husbands. We were going to a special event and I wanted him to stand out a bit. 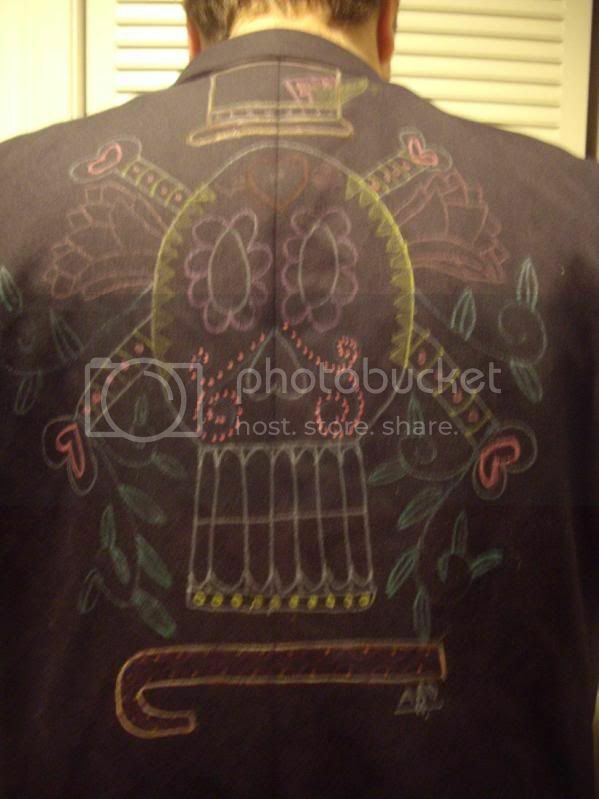 The back features a decorative skull and the front has an anatomical heart and a flower similar to those on the back. 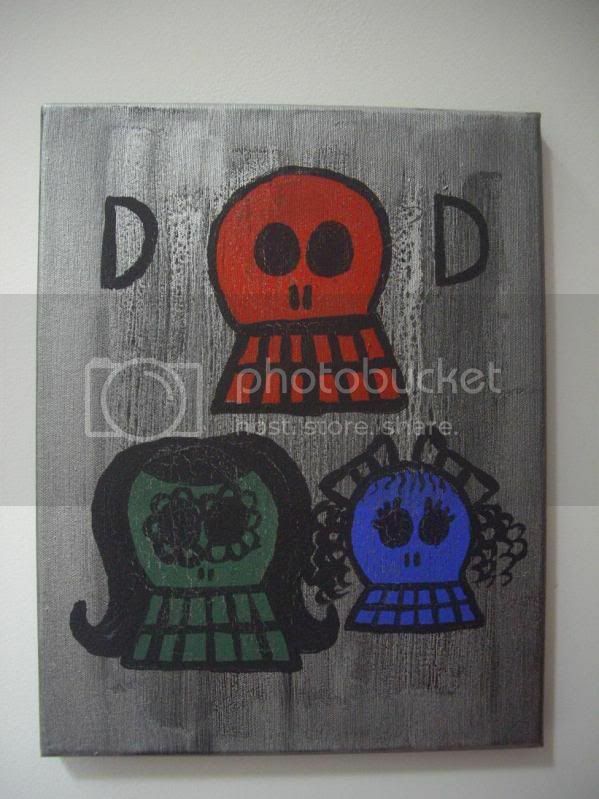 The Family Portrait and Jacket were both featured on http://www.skulladay.com/ on August 1, 2009. I was very happy to see them there. These other ones are recent creations that were spawned out of sudden creative motivation when cleaning my explosion of craft area also known as my dining room. I found these blank canvases and well they needed decoration. I have put a few on some black tote bags, but I have not photographed them yet, so I will update them to my blog on a different day. 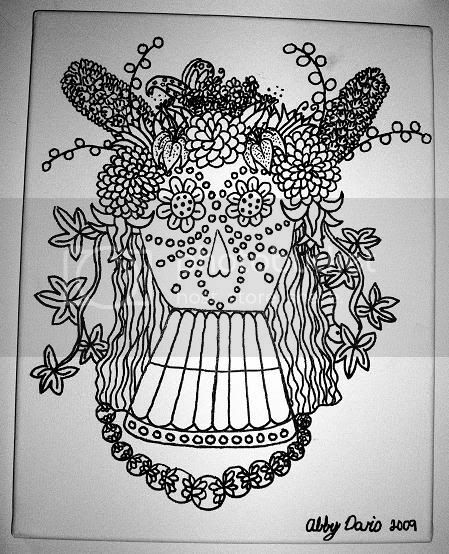 I really dig that B&W canvas with the flower-sugar skull design. The jacket is great too. Your husband is a lucky duck! Thanks. I enjoyed making them.